KATHMANDU, Sept 20: The death rate among migrant workers is similar to that of the Nepali population for the same age group, according to a recent research report. A research report, 'When the safety of Nepali migrant workers fails: A review of data on the numbers and causes of death of Nepali migrant workers' published by the International Labor Organization (ILO), states that the crude death rate for the overall population of Nepal is higher than the total proportion of deaths to the number of migrant workers abroad. 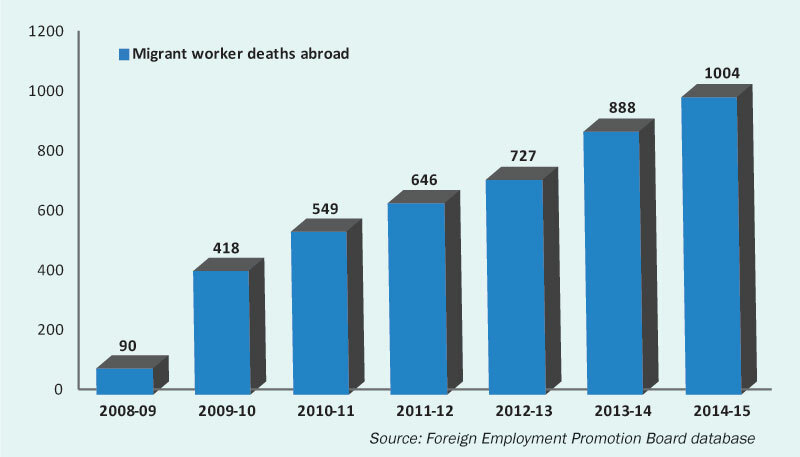 The annual death rate of migrant workers during foreign employment from fiscal year 2008/9 to 2014/15 remained at 1.59 per 1,000, which was significantly less than the crude death rate for the overall population of Nepal, at 7.3 per 1,000 population, it reads. However, national estimates include all age groups, while the majority of migrant workers from Nepal are youths. The annual death rate per 1,000 population stood at 0.40, 1.42, 1.54 and 1.67 for the fiscal years 2008-09, 2009-10, 2010-11 and 2011-12, respectively. Similarly, the death rate per 1,000 population remained 1.61, 1.70 and 2.00, respectively for the fiscal years 2012-13, 2013-14 and 2014-15. Highlighting the need of medical tests, the report states, “Health institutions in Nepal are responsible to certify the good health of migrant workers before departure through screenings. The Foreign Employment Permission Board (FEPB) database uses eight categories to report on causes of deaths: cardiac arrest, heart attack, natural cause, suicide, traffic accident, workplace accident, murder and other or unidentified causes. The report attributes the problem of unscientific classification to the reports on deaths. “These categories were not created in consultation with medical or public health experts but reportedly emerged based on the frequency with which they appeared on death certificates at the time the database was created in 2008,” it says. Categories such as cardiac arrest, other or unidentified cause and natural cause are too ambiguous to provide any useful information for developing interventions to ensure the well-being of migrant workers, according to the report. The report further mentions that there is room for improvement of data availability, collection and use. It recommends that a robust database system must be developed that links various sources so that missing data can be found. The FEPB database should be upgraded in consultation with public health experts who can provide better classification and interpretation of data, particularly on the causes of death, the report recommends to the government. It also recommends to all Nepali embassies to institutionalize the process of death audit so that there is no discrepancy in compensation to be received by family members of deceased migrant workers.